An argument that we should be optimistic about the capacity of "methodologically omnivorous" geologists, paleontologists, and archaeologists to uncover truths about the deep past. The "historical sciences"--geology, paleontology, and archaeology--have made extraordinary progress in advancing our understanding of the deep past. How has this been possible, given that the evidence they have to work with offers mere traces of the past? 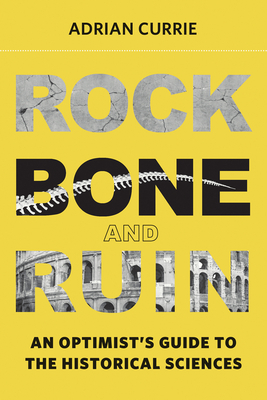 In Rock, Bone, and Ruin, Adrian Currie explains that these scientists are "methodological omnivores," with a variety of strategies and techniques at their disposal, and that this gives us every reason to be optimistic about their capacity to uncover truths about prehistory. Creative and opportunistic paleontologists, for example, discovered and described a new species of prehistoric duck-billed platypus from a single fossilized tooth. Examining the complex reasoning processes of historical science, Currie also considers philosophical and scientific reflection on the relationship between past and present, the nature of evidence, contingency, and scientific progress. Currie draws on varied examples from across the historical sciences, from Mayan ritual sacrifice to giant Mesozoic fleas to Mars's mysterious watery past, to develop an account of the nature of, and resources available to, historical science. He presents two major case studies: the emerging explanation of sauropod size, and the "snowball earth" hypothesis that accounts for signs of glaciation in Neoproterozoic tropics. He develops the Ripple Model of Evidence to analyze "unlucky circumstances" in scientific investigation; examines and refutes arguments for pessimism about the capacity of the historical sciences, defending the role of analogy and arguing that simulations have an experiment-like function. Currie argues for a creative, open-ended approach, "empirically grounded" speculation.